Hugh Waters has been a USPTA Master Pro for twenty years as well as a Teaching Pro for over 35 years. He has led many junior players to high national rankings and college scholarships. In A Better Mind Makes A Better Player he has presented us with a glimpse into exactly how he has accomplished this. A Better Mind Makes A Better Player is one of the most unusual tennis books you will read. 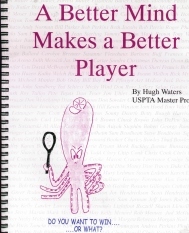 In his simplest way of showing us what he has shown his pupils, Hugh Waters presents this book strictly as dialogue between a pro and the player who comes to him looking to improve his game. Through 15 lessons, the conversation progresses through improving mental abilities as well as physical skills. A Better Mind Makes a Better Player is an excellent tool for the club player looking to work his way up the ladder and the junior player looking to improve her national ranking. The conversations between pro and player flow naturally and make sense to players of all ages.